What do you say when you’re feeling afraid? Threatened? Lonely? Hungry? Playful? Humans have a range of options to verbalize their feelings. Aside from a whimper or a whine, dogs have just one means of audible communication: barking. As any dog lover knows, they can adjust the tone, tempo and volume of their barks, but that’s about it. When it comes to communication, your dog is actually a one-trick pony. Why do dogs bark? They’re feeling afraid. Threatened. Lonely. Hungry. Playful. That can add up to a lot of vocalization, and excessive barkers can certainly be a nuisance. They can annoy your neighbors and prompt other dogs to bark in what becomes a cascading cacophony that can rock the whole neighborhood. They can keep you up at night, and quite simply, drive you barking mad. The PetSafe® Spray Bark Collar is one option to silence chronic barkers. It releases a harmless burst of light spray in front of the dog’s snout when it senses that your dog is barking. Your buddy will quickly learn that chronic nuisance barking is no longer an option. But to understand solutions, you must first understand the problems. 1. Here comes trouble. Dogs are territorial pack animals, and you and your family are part of the pack. Dogs respond to perceived threats with barking. The problem is that dogs aren’t always the most discerning creatures when it comes to assessing threats. That’s why a nocturnal possum — or another passing dog — gets the same treatment as an actual danger to the pack’s safety. As a “threat” increasingly presents itself, however, dogs will bark longer and louder. If your dog is hyper-vigilant and prone to barking, a PetSafe® Spray Bark Collar will help stop night-time barking. 2. Confinement. Dogs are social animals and will literally beg and bark for attention if they are restricted by a leash, confined in a kennel or left alone all day. This behavior gives rise to nuisance barking as the dog habitually responds to its isolation. If your dog must be confined during the day, he may be a good candidate for a PetSafe® Spray Bark Collar. 3. Fear. Some dogs with elevated fear responses react with excessive barking. Those with heightened or unreasonable fear responses will bark at virtually every unexpected or unusual noise, including car horns, slamming doors, shouting children, other dogs or someone dropping a garbage can down the street. Dogs with such fear responses tend to bark even more loudly and longer, as they are trying to project themselves as bigger and more fearsome than the perceived danger – even if it’s a squirrel chattering harmlessly in a tree. 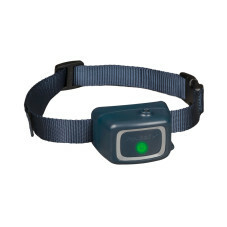 A PetSafe® Spray Bark Collar is a good solution to stop night-time barking and other fear responses. 4. Let’s play! Dogs, especially younger dogs, are naturally playful. They get excited when they want to play and will bark accordingly. This is normal and almost endearing behavior that doesn’t usually escalate into chronic nuisance barking. 5. I missed you! One of the most satisfying things about life with a dog is the fact they miss you terribly when you’re gone and greet you with full-throated enthusiasm when you return to the den. They will bark to welcome you home and hope to segue into playtime with their favorite human. That’s not a nuisance. That’s love. Whether you have a dog who barks at the moon or bays at unseen things, we have a cutting-edge anti-bark solution for you: the PetSafe® Spray Bark Collar.